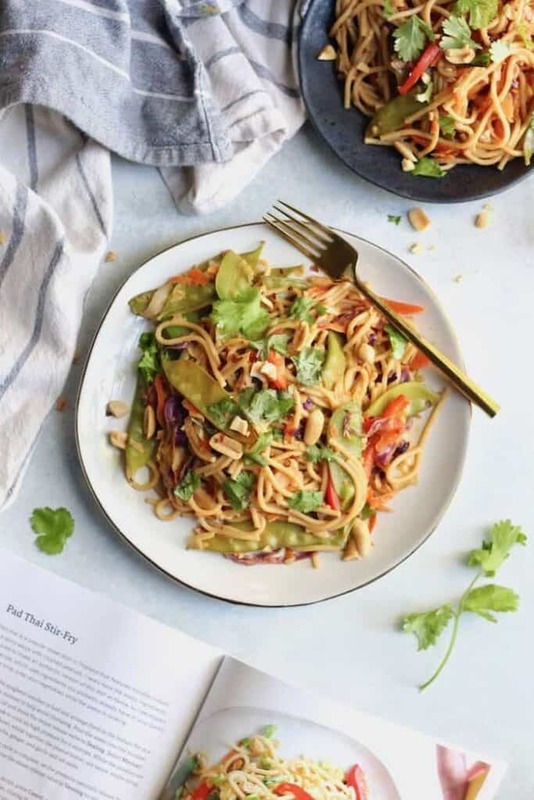 This flavorful and healthy Instant Pot Pad Thai Stir Fry packed with veggies uses ingredients you already have on hand! Vegan and gluten-free option + easily made on stovetop as well. I feel like I’ve been living under a rock. When the Instant Pot became all the rage over the holidays last year, I kind of…ignored it. Me, a dietitian and food blogger and restauranteur, turning a blind eye to the latest and greatest in quick cooking. The horror! 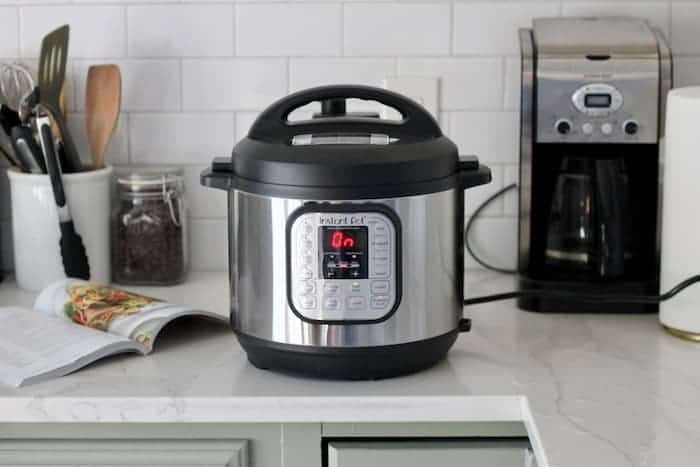 So when my friend Megan emailed me about her new Fresh and Healthy Instant Pot Cookbook, I was forced in the best way possible to hop on the trend train and give this beloved electric pressure cooker a whirl. Was I intimidated? Very. Did I procrastinate until 5pm when there was barely any daylight left to learn how to use this thing, make the vegetarian Pad Thai Stir Fry recipe, and photograph it? You bet your hiney! But to be honest, it was SO much easier and far less intimidating than I made it out to be in my head. I admittedly hate reading manuals; but once I learned how to fit the darn lid on (and ok, had Megan send me a video of her using it), I was totally fine. I always thought pressure cookers were for things like cooking dried beans, but with the pot-in-pot method, you can make so many meals without dirtying other dishes. Nearly all the cooking time is hands-off, so you can do your laundry or respond to emails or pluck your eyebrows (is that just me?) while things cook. 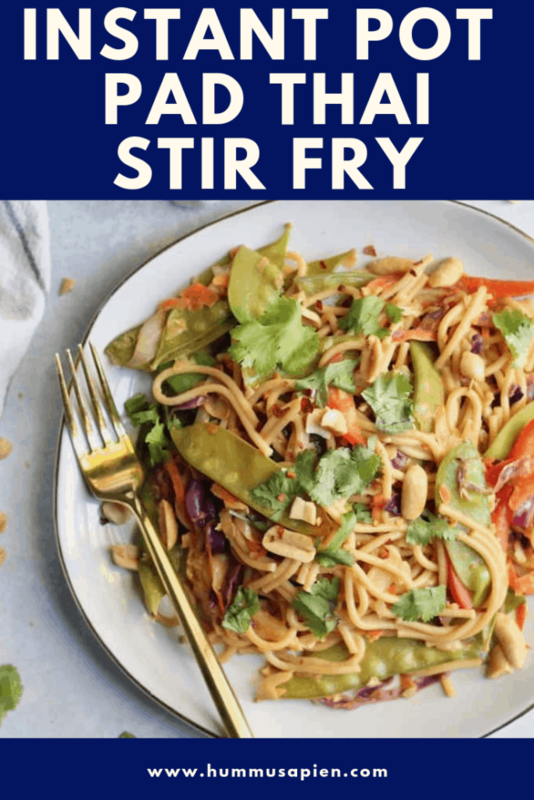 My favorite things to cook in the Instant Pot are bulk grains like brown rice, quinoa, millet, and oatmeal plus those simple “set it and forget it” meals like Instant Pot chili, all the soups, and this here vegetarian stir fry. The Instant Pot makes meal prep so much more efficient because it’s completely hands off. Is Cooking in Instant Pot Healthy? Yes! Pressure cooking is one of the healthiest ways to cook since there’s less oil involved and nutrients aren’t being lost. Another fun fact I learn from Megan is that the pressurized pot lowers the boiling point of water, so your food is rarely cooked at a temperature above 250 degrees. Lower temps means fewer nutrients lost, as does shorter cooking times. Did you know the instant pot cooks 50-70% faster than traditional cooking methods? Of note, the Instant Pot doesn’t always shorten the cooking time, but it does decrease the active time since it times everything for you. It takes time for the pot to come to pressure before the cycle begins and to release that pressure when the cycle ends. The time to come to pressure is similar to the time it takes for water to boil. All of Megan’s recipes include the total time needed for pressure cooking. So here I am in the present day, totally enamored with this gadget. It’s like a miracle worker! For this recipe, you cook the noodles in the pot and stir together the delectable peanut buttery pad thai sauce while they’re cooking. Once the noods are done and perfectly cooked thanks to the magic of the Instant Pot, you drain the noodles, dump the sauce in the Instant Pot, add the veggies, and sauté it all together. No other dirty pans! It comes together in no time. Clearly, I’m a fan. I love that Megan’s book features so many classics that are appealing to everyone and also a meat chapter that Jeff is super pumped about. I really appreciated how this book took me out of my comfort zone. It has 75 hearty and comforting recipes developed with optimum flavor, nutrition, and speed in mind. Think Cauliflower Mac N’ Cheese, Kungpao Chickpeas, Eggroll in a Bowl, Deep Dish Pizza Casserole, and One Pot Chocolate Cake with Chocolate Frosting. Every recipe has a photo and a gluten-free option and nearly all recipes have a tested vegan option. Can I Make Instant Pot Stir Fry on the Stovetop? Indeed. You can easily make this scrumptious Instant Pot Pad Thai Stir Fry on the stovetop. Simply cook noodles in a pot according to package directions, stir together the sauce, then drain and rinse the noodles. Keep them in the strainer while you add the sauce to the sauce pot along with the veggies. Sauté for about five minutes, combine with noodles, and you’re done! Easy peasy pad thai squeezy. Please let me know how this Instant Pot Pad Thai stir fry recipe turns out for you by leaving a star rating and/or comment! I hope you adore it as much as I do. 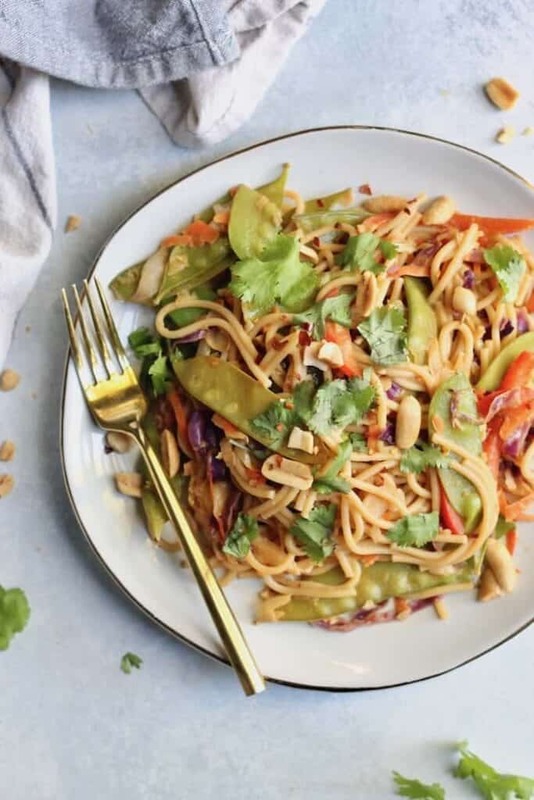 This flavorful and healthy Instant Pot Pad Thai Stir Fry packed with veggies uses ingredients you already have on hand! Vegan and gluten-free option! Easily made on stovetop as well. 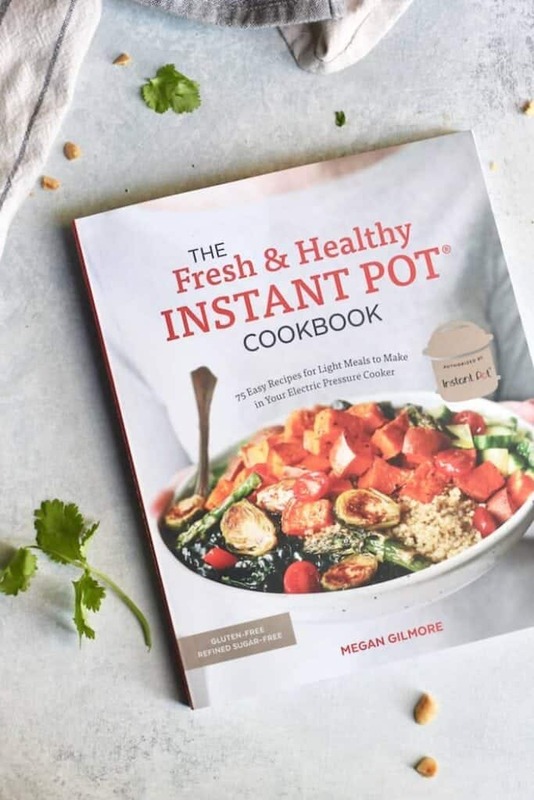 Reprinted with permission from The Fresh & Healthy Instant Pot Cookbook, by Megan Gilmore, copyright © 2018 Megan Gilmore. Published by Ten Speed Press, a division of Penguin Random House LLC. Break noodles in half and arrange in Instant Pot in a crisscross manner to avoid clumping. (See notes at the bottom for stovetop option**.) Pour water over noodles. Secure lid and move steam release valve to Sealing. Select Manual/Pressure Cook to cook on high pressure for 2 minutes. While noodles cook, in bowl, whisk together peanut butter, soy sauce, maple syrup, lime juice, Sriracha, ginger, and garlic and set aside. When the cooking cycle is complete, let the pressure naturally release for 10 minutes, then move the steam release valve to Venting to release any remaining pressure. When the floating valve drops, press Cancel and remove lid. Drain noodles through colander, rinsing with cold water to remove starch and stop cooking. Rinse and dry insert and return to Instant Pot. Serve pad thai warm with cilantro and peanuts on top. Dish is best served right away, but leftovers can be stored in an air-tight container in fridge for 5 days. *If using brown rice spaghjetti, cook on high pressure for 0 minutes (see page 17 of book), then let pressure naturally release for 8 minutes before draining. **Stovetop option: Cook noodles in a pot according to package directions. Whisk together sauce. Drain and rinse noodles and keep them in the strainer while you add the sauce to the sauce pot along with the veggies. Sauté for about five minutes then add noodles and green onions. The recipe doesn’t call for that but feel free to garnish as you wish! I was wondering the same – you’ve listed sriracha in the method for the sauce but it isn’t on the ingredients list? You listed siracha as an ingredient in the sauce in the instructions. But its noy in ingredients list. Can u clarify for us who want to make this please? Just fixed the recipe. It should be 1 tbsp sriracha and 1 bell pepper. Enjoy! The directions mention sriracha and pepper (I’m guessing bell pepper) not listed in ingredients—-can you help? Sorry about that–just fixed! 1 bell pepper and 1 tbsp sriracha. UGH. Why do people use the term “Pad Thai” for a dish that simply isn’t pad thai? Pad thai has rice noodles, not whole wheat spaghetti. More important, the essential flavor of pad thai comes from tamarind and fish sauce, neither of which is in this recipe. There is no peanut butter in pad thai. No maple syrup either. I can’t say this dish isn’t tasty, but call it Asian Peanut Noodles or something. It is absolutely not pad thai. Hey, Davey! Yes, I am aware that real Pad Thai isn’t made with spaghetti and peanut butter :) The beauty is that this version uses items most people already have in their pantry versus things like tamarind and fish sauce. It’s not the most authentic, but hey, that’s what good takeout is for, right? Glad the name didn’t stop you from enjoying it. Have you tried the instant pot method with brown rice noodles? I just did and they came out like complete mush! This has been my favorite Instant Pot recipe so far! Amazing flavor! SO glad! Thanks for letting me know, Jesse. I forgot to add the maple syrup, but this was still very tasty. I will definitely be making it again and add the maple syrup next time.